What the direction changes in Kata mean. ‘This video was filmed in July 2011 at Marc and Dianna MacYoung’s annual Animal List BBQ in Colorado, USA. I taught for a couple of hours on the Saturday where I covered general kata principles. This clip shows a little of our discussion on angles in kata and why things are in threes. We know that it is advantageous in conflict to be off the enemy’s attack line, while they are still on yours. The angles in kata therefore tell us the angle we should be at in relationship to the enemy. It does not, as is commonly thought, mean the enemy is at that angle. To think that was puts everything back onto straight lines and leads to highly-impractical bunkai. People sometimes find this way of thinking difficult, but it’s actually very simple when you get used to it. 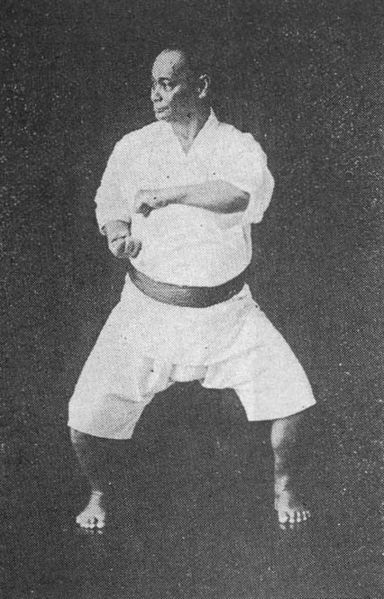 All angles are referenced to the kata performer and a change of angle in kata means the corresponding angle should be assumed in relationship to the enemy i.e. at 45 degrees, to the side, or behind the enemy. If you want more detained explanations on this, you should check out my “The Pinan / Heian Series: The Compete Fighting System” DVDs.